A few years ago, PBS debuted a new reality TV series called “Colonial House”, where they chose a dozen “modern-day time travelers” to find out what it was like to live as the early American colonial settlers did back in 1628. You might think this show would be boring - “oh, wow, this peaceful candle making just got hijacked by Goody confronting Prudence about sleeping during the morning prayer! This really is going to be the most dramatic Colonial House episode ever!” - but it was actually pretty rad: The men, women, and children arrived in “The New World” via a period tall ship (worth the price of admission alone, in our opinion) and then struggled to create a functioning and profitable colony, using only the tools and technology of the era. The biggest “discovery” (get it?”) the show made was that, while history often paints a stodgy and drab picture of our colonial forebears, they were actually a pretty rebellious and scrappy group. And, they kind of had to be…what with the indentured servitude, no baths or showers, and public punishments? It’s no wonder they often made the most of it by wearing bright-colored clothing, consuming large amounts of alcohol, and testing the laws of the era. 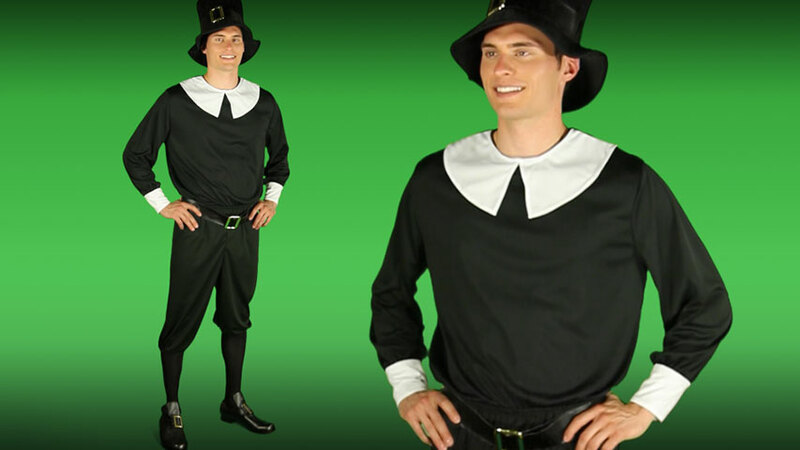 So don’t be fooled by the tradition garb of the stereotypical Pilgrim…those guys may have had to go to church for 4 hours every Sunday (not joking), but they still knew how to have a good time! After all, you don't become known for being the original co-hosts of a feast that was so great that it became a national holiday if you're a boring dinner guest, right? So whether you're donning this Pilgrim Man Costume for a costume party, Halloween, or just to make your Thanksgiving holiday a little more festive, let everyone know that, while you're here to give thanks, you're also here to (Plymouth) rock! 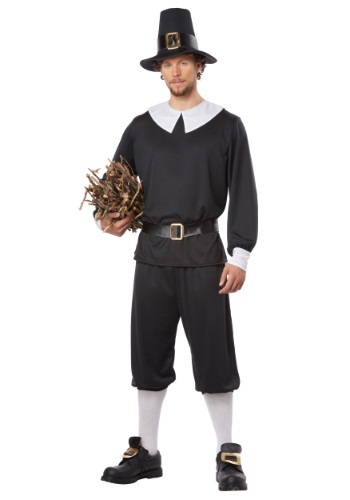 Our pilgrim will be part of a "pilgrim group", and he fits in perfectly. This costume is a winner.